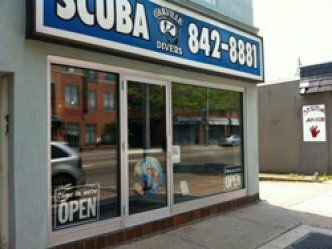 Oakville Divers Scuba Shop has been operating as a full time dive gear scuba shop and PADI scuba diving school for over 25 years with our original owner and Master Instructor in Oakville, Scuba Ontario, Canada. Our Master Instructor Robert Shannon has been scuba diving since the age of six. He comes from ascuba family one of the Original Plankholders in the Canadian Diving Community. Robert early years were spent working in the family dive shop, training scuba students , attending openwater certification dives, divemaster, rescue diver, tank filler, commercial diver, repair technician, retail sales and dive friend. Robert continued his diving career by opening Oakville Divers Scuba Shop and is the go-to guy for all things related to diving , ice and marine Hollywood North Film. Drop by and meet our Oakville Divers Scuba Pro Robert for the best scuba training, sales, service in the Toronto GTA area. Our focus is on the quality of scuba experiences and diver in depth safety knowledge. As a result our Oakville Divers scuba students are some of the best trained, comfortable and safest divers in Canada. Oakville Divers Scuba Team always goes the extra mile because your Family's Safety and dive enjoyment are our primary concern. We offer all levels of scuba diver training ; from entry level scuba diving certification through to professional diver instructor development. We also teach a wide range of scuba diving specialties to enhance your diving experience. At Oakville Divers, we are more than just a dive shop. We offer local dive charters on our custom dive boat and group travel to some of the best dive sites around the scuba world. A experienced scuba shop staff, excellent dive facilities, Major Brand Names of Quality Scuba Gear and Equipment, Dive Team and Full Time Professional Master Scuba Instructor, practical sales advice to help you choose the best scuba product for your needs, factory certified scuba service center, pool 150 meters from shop,dive boats 60 meters from shop. Oakville Divers a has an active diver community scuba team with regular organized activities and events to ensure you will meet new dive buddies, socialize , scuba dive together and have safe fun diving adventures. 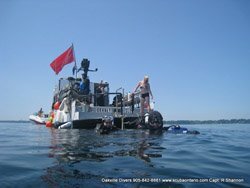 Contact us 905-842-8881 or come visit our Southern Ontario Professional dive shop, conveniently located right in the Heart of Oakville Harbour Historic sites, shopping ,dining, and Lake Ontario Scuba Diving..